Lost and Gone Forever Album reviews. Pop music today is sickening. Backstreet Boys, Christina Aguilera, Britney Spears, etc - they are all examples of how music is going to hell. If only there were pop music that relied more on musical talent instead of being a "hottie." Oh but there is� there is. Bands like Fountains of Wayne and the Promise Ring have shown us the light at the end of the tunnel. Because of bands like them there is still hope for music. There is still time for it to be renewed, for the industry to look at itself and think, "What the hell are we doing?" 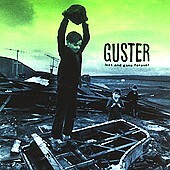 Guster is another example of a pop band that shows definite promise. Their third album Lost and Gone Forever is a collection of pop songs, but "good" pop songs. While listening to the songs off this album, one can't help but start to sing along. You don't even have to really know what they are saying, you can sing along without actually realizing it. Lyrics like "4, 3, 2, 1, when at the barrel of a gun" (from "Barrel of a Gun") are just catchy. The song is nothing groundbreaking - it is just a song about a person obsessed with a movie star, but the song is still great. Musically this album is a bit different from other pop rock albums. It is much lighter than say, The Promise Ring's Very Emergency. Adam and Ryan are both on vocals and guitars. Brian plays percussion, but without sticks. His fingers are wrapped and he plays everything with his fingers, lightening their sound considerably. Congas are heavily employed throughout, earning Brian the title of "Legendary Conguero." And no, there is no bassist. The sound is similar to bands like Toad the Wet Sprocket, Matchbox 20, Semisonic, and the Goo Goo Dolls, but a little lighter. Influence from bands such as Sugar, REM, and Phish are readily apparent. Lost and Gone Forever is a refreshing change in pop music. Guster is not out to prove anything other than that they are a band of good musicians. They have been at it for a long time. Their first album, Parachute, was released under the name GUS, the band changed their name for their second album, Goldfly. On Lost and Gone� Steve Lillywhite produced (he has also produced for Dave Matthews). Through his production, the band finally achieved what they have been trying to do for some time now, to capture the sound of their live show. For people who are looking for an album just to have fun with, this is a great album to start with. The band is definitely having a great time with their music, and their enjoyment shows through. "Up to Heaven" revolves what is almost an acoustic "Girl from Ipanema(sp)" theme, is sung entirely in falsetto, and incorporates cheap lyrical rhymes like "just relax, greener grass." Sure, the music is commercially focused, and the lyrics are nothing too inventive. Who really cares, so long as it is good? Guster may play pop music, but Guster has yet to become popular. Let's hope this album does it for them. They definitely deserve it.